From the draw for the eighth-final of the 2013 Coupe de France, Aulnoye from NF1 had the best chance of causing a major upset with a match against LFB club-side Charleville-Mézières. Aulnoye were the lucky team from the first round with a bye and qualification for the eighth-final without having to play. For the first 20 minutes they made home advantage count as they went into the interval all square (29-29). They managed this with the help of Tereza Vorlova (18 points), a former Czech Republic youth international, and Caroline Plust (11 points) with 6 and 9 points respectively at the break. For Charleville-Mézières Aurélie Bonnan (12 points, 11 rebounds) with 8 first-half points was the most active player offensively. After the break Djéné Diawara (23 points, 12 rebounds) from Charleville-Mézières stepped up offensively with Aulnoye finding themselves trailing by 7 points (36-25) with 15 minutes to play. Charleville had no problems the rest of the way and punched their ticket for the next round (75-60). 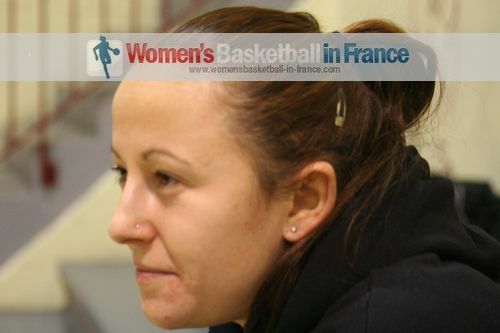 Amel Bounderra and Anne-Sophie Pagnier (in picture) also finished in with double digits scores with 13 and 11 points respectively. COB Calais, one of the best teams in LF2, did well for the first 20 minutes against USO Mondeville despite trailing (35-47). Calais made 50% of their shots (11-from-22), but Mondeville were also shooting well (21-from-40). Mondeville stepped up defensively during the third quarter restricting Calais to just 8 points while scoring 27 points. The contest was over and Mondeville went on to win (90-55) with five players in double digits. Ingrid Tanqueray with 11 assists, 4 steals and 10 points was the leading player for Mondeville while Aurélie Cibert with 19 points, 3 steals and 5 assists was the best player from Calais. The holders of the Joë Jaunay trophy Arras were taken to overtime by Hainaut Basket before coming out on top (75-68). Ify Ibekwe's three-point buzzer beater (67-67) denied Arras the victory in regulation time. But she could do nothing to stop Sandra Dijon-Gérardin (17 points, 12 rebounds) during the extra five minutes who pushed her team to victory. Bourges Basket were at their best defensively in beating Villeneuve d'Ascq (54-47). Olayinka Sanni from Villeneuve was the best player of the match with a game high 25 points. Lyon BF have to thank Mame-Marie Sy-Diop who went 9-of-10 from the charity stripes while scoring 15 points as they beat Perpignan (57-54). Toulouse Métropole's home is not their castle at the moment as it was the turn of Nantes-Rezé to take advantage to win (80-70). Gunta Baško-Melnbārd's good form continues as she had her best all round game of the season scoring 16 points for the visitors. Lattes Montpellier survived a tricky visit to Aix-en-Provence (59-52). Géraldine Robert was in excellent form for Montpellier with 19 points, 5 steals and 9 rebounds while Cayla Francis scored 20 points and collected 16 rebounds. In the south derby Basket Landes won for the first time in their history in Tarbes (81-72). Anaïs Le Gluher-Cano found her range from behind the three-point line (5-of-7) in leading her team with 24 points.